Ok, round-up is a bit of an exaggeration but over the last 10 months I’ve tried three different stylus solutions and one has come out as a definite favourite. 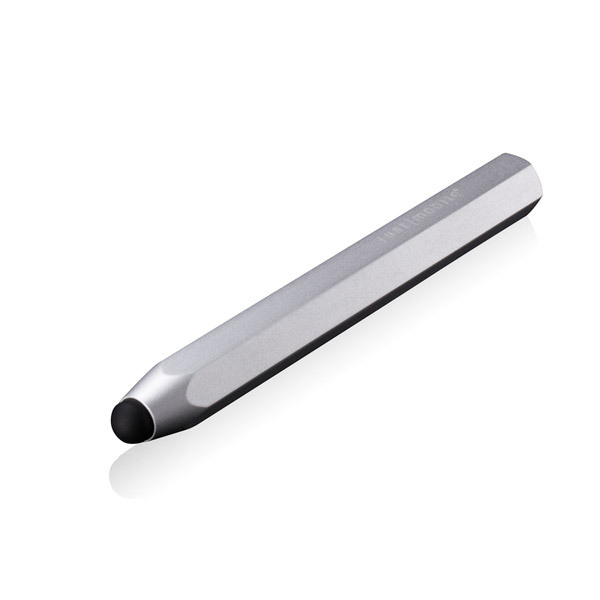 The first one I tried was recommended almost everywhere after the iPad had come out – the Pogo Sketch from Ten One Design. It was fairly inexpensive at around £12 as I had it shipped from America. The stylus felt good in the hand but I never felt comfortable with the nib. It was like a piece of polystyrene had been painted black and stuck on the end of a nice thin metal tube. The Sketch was accurate and was better at certain tasks than my fat fingers but I never enjoyed using it. The design really irked me. So the next stylus I tried was the Boxwave iPad stylus. This was a much improved design and featured not only a clip so you could attach the stylus to an iPad case (worked well with the default iPad case) but also a small plastic attachment that fitted inside the 3.5mm headphone jack so the stylus could be attached to the iPad. Over time I found the headphone attachment got in the way but it’s easy to unclip from the stylus. The nib was also made os soft rubber which was a lot better than the Pogo Sketch. I really liked the weight of the Boxwave and it’s design but I had one issue. There were certain times that my inputs wouldn’t be recorded on screen. I’m not sure why but it would work 95% of the time and the other times I would draw a line, squiggle or text and when I lifted the stylus, the whole input disappeared. Very odd and quite annoying. Still not happy I then tried another stylus and finally found one that worked accurately and also felt great in the hand due to it’s design an weight. The Just Mobile AluPen is far chunkier than the other two products I tried and features a soft rubber nib similar to the Boxwave. I just love the look of AluPen and find it very comfortable in the hand. The weight is also just right and despite the angular design it never gets awkward. Despite the size the nib allows for fine control and drawing on the iPad and unlike the Boxwave it works every time. Joy. One point to watch though is that the price is higher than other similar solutions. The official website has the ALuPen and it’s colour variants priced at over ¢30 but I picked up the silver AluPen for £14.99 from Amazon. Colour versions were all higher priced – the red looks really good and reminds me of the Ironman colours. So the AluPen has become my favourite stylus for the iPad and very handy for the times where I want some slightly better control than my finger offers.